I found a very detailed and interesting review of the Canon EOS 30D, which highlights things I haven’t heard about in previous reviews. While still able to shoot at a fast 5 fps rate, the Canon EOS 30D is also switchable to a low-speed 3 fps continuous shooting rate. The 30D can also shoot at rated speed with non-USM (Ultrasonic Motor) lenses while the 20D fell back to 3.5 fps when using these. 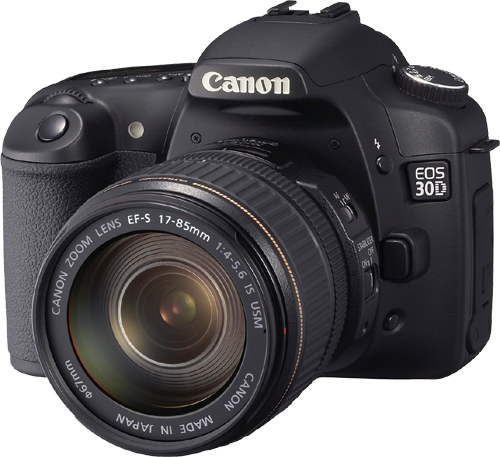 Those shooting in quiet venues such as weddings will like the Canon EOS 30D’s quieter shutter sound. The 20D shutter has a “CLACK” sound to it whereas the 30D has a more subtle sound. Shapes around the flash head and lens mount have been changed subtly to suggest Canon’s upper-range models. The mode dial now has a metallic finish. The grip below the shutter button has been extended for better purchase with the middle fingers and improved overall handling. A new groove where the middle finger falls improves comfort and security. The first thing I noticed when picking up the 30D was the grippier surface on the rubber grip. The reshaped grip is nice, but just slightly different than the 20D. Sounds good. Only a small improvement, but hey, don’t fix what ain’t broken. Style 1 – Standard is for users who do not intend to do any post-processing of their images. Right out of the camera, the pictures look crisp and vibrant, with the sharpness set to 3 and the color tone and saturation set to obtain vivid colors. Excellent prints will eventuate without any further adjustment. It is equivalent to parameter 1 on the EOS 20D. Style 2 – Portrait has color tone and saturation settings that yield natural skin tones. The sharpness is set one step weaker than the Standard setting so that skin and hair look softer. Style 3 – Landscape has color tone and saturation settings that give vivid blues and greens for skies and greenery. The sharpness is set one step stronger than the Standard setting so that the outlines of mountains, trees, and buildings look more crisp. Style 4 – Neutral yields natural color reproduction, and no sharpness is applied. This setting is ideal for post-processing and is the same as the EOS-1D Series defaults. light, the color is adjusted colorimetrically to match the subject’s color. No sharpness is applied. This setting, too, is designed for workflow that includes post-processing. Style 6 – Monochrome with filter effects and color tones, is the same as the EOS 20D’s monochrome setting. SET-button options (no. 1). You can link it to recording quality or Picture Style selection. I would definately set it to the latter, since it would be very useful to have quickly available when shooting. AF-assist beam options (no. 5). Allows you to disable the AF-assist beam when you haven’t got an external flash unit. I’ll probably do this since I find the stroboscope style AF-assist of the built-in flash really annoying. Mirror lock-up (no. 12), to reduce shake when shooting long exposures at long focal lengths on a tripod. Quick focus point selection with mini joystick (no. 13). The default setting requires you to press the AF point selection button first. With this custom function enabled you can use the mini joystick directly. I plan on selling my EOS 300 with the 28-90mm lens, but I’ll hang on to my 75-300mm for now. Hopefully I’ll get the EF 70-300mm f/4-5.6 IS USM sometime in the future. (Which is sharper than my current lens, and has 3-stop image stabilizing.) I already have the 420EX flash, which will work great with the 30D. I’ll let you know when I buckle under and order it. Posted at 08:56. Tags: Canon EOS 30D. Categories: Canon, photography. Both comments and trackbacks are closed. The EOS 300 I own now is non-digital. If you misunderstood me. Cool!What cameras have you had previously?